In case you are wondering... What is GloBI?, Why GloBI?, Who makes GloBI possible?, How to share data through GloBI?, GloBI in the wild, How to use GloBI as an educational tool?, How to cite GloBI? and Who cited GloBI?. Global Biotic Interactions (GloBI) provides open access to finding species interaction data (e.g., predator-prey, pollinator-plant, pathogen-host, parasite-host) by combining existing open datasets using open source software. Like videos? Then you might like this 2 minute GloBI introduction video. “The various books and journals of ornithology and entomology are like a row of beehives containing an immense amount of valuable honey, which has been stored up in separate cells by the bees that made it. The advantage, and at the same time the difficulty, of ecological work is that it attempts to provide conceptions which can link up into some complete scheme the colossal store of facts about natural history which has accumulated up to date in this rather haphazard manner. This applies with particular force to facts about the food habits of animals. Until more organised information about the subject is available, it is only possible to give a few instances of some of the more clear­cut niches which happen to have been worked out.” - Charles Elton, 1927. Animal Ecology. Now that folks have mapped the human genome, put a man on the moon, isn't it time to provide easy access to how, when and where organisms interact with each other so that we can better understand and better preserve our ecosystems? Perhaps GloBI can become the OpenStreetMap of ecology: a global map that shows how organisms rely on each other . . .
By providing an infrastructure to capture and share interaction data, individual biologists can focus on gathering new interaction data and analyzing existing datasets without having to spend resources on (re-) building a cyberinfrastructure to do so. GloBI is made possible by a community of software engineers, bioinformaticists and biologists. Software engineers such as Jorrit Poelen, Göran Bodenschatz, and Robert Reiz collaborate with bioinformaticists like Chris Mungall, data managers like Sarah E. Miller and biologists like Jim Simons, Anne Thessen, Jen Hammock and Brian Hayden to capture, provide access to and use interaction data that is provided by biologists and citizen scientists around the world. GloBI is sustained by an intricate network of thriving open source, open data and open science communities in addition to receiving donations, grants, awards or being written into grants, including, but not limited to, EOL's EOL Rubenstein Fellows Program (CRDF EOL-33066-13/F33066, 2013) and the David M. Rubenstein Grant (FOCX-14-60988-1, 2014), and the Smithsonian Institution (SI) (T15CC10297-002, 2016). If you would like to contribute to GloBI please visit our contribute page. How to share data through GloBI? GloBI exists because of people like yourself who share their interaction data, or refer to existing datasets that are not yet included in GloBI. Do you have some interaction data you'd like to access through GloBI? Please read this. How to use GloBI as an educational tool? Education experts such as Marie Studer and Jeff Holmes at EOL Learning + Education have developed tools and lession plans to better understand food webs in specific and ecosystems in general. Also, Daniela Baron et al. created an Interactive Ecosystem Explorer for high school students. In addition, many other educational resources exist including, but not limited to, hhmi's Trophic Cascades and Earth Viewer. Ideally, GloBI will help facilitate to create, and improve, these openly accessible educational resources. 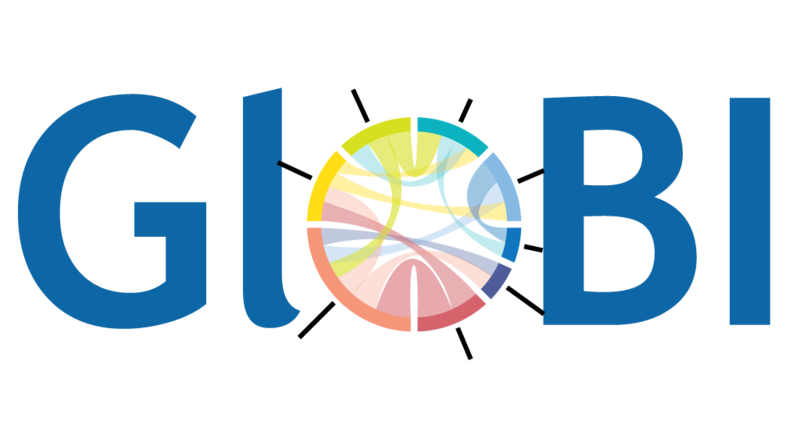 The Encyclopedia of Life (see blog post) and Gulf of Mexico Species Interaction Database (see blog post) are currently using GloBI's data services. We also built some web apps on top of our data services: list references and data sources, figure out who eats what and browse interactions around the globe. The R community uses rGloBI (part of rOpenSci) to access interaction data (see Hungry Caterpillars for example). Also, students of Indiana University's Information Visualization MOOC created a Food-Web Map of the World (class of 2014) and an interactive ecosystem explorer (class of 2015) (poster, paper) using GloBI data. Some more mentions include Global Biotic Interactions (GloBI). Bichos vemos, relaciones sí sabemos., Datos: Global Biotic Interactions, OpenHelix's Video Tip of the Week, Py4Life's mini-lecture using Python and GloBI as part of Python Programming for Biologist course at Tel-Aviv University and a colorful network visualization by Anneke ter Schure (see live example). In addition, the Report of the Task Group on GBIF Data Fitness for Use in Distribution Modelling published by the GBIF Secretariat on 22 March 2016 suggested that GloBI should be linked and integrated with major biodiversity portals to facilitate modeling of biotic interactions. Also, Vince Smith of the Natural History Museum, London mentioned GloBI as part of his talk NHM Data Portal: first steps toward the Graph-of-Life (see slides pp.26-30, video at 35min) at the 31st annual meeting of the Society for Preservation of Natural History Collections (SPNCH) on 23 June 2016 in Berlin, Germany. And, Katja Schulz of the Smithsonian Institution and Encyclopedia of Life presented a poster Pragmatic, scalable aggregation of organismal interaction data at TDWG 2016 in an effort to help build a community to provide open access to, and use, organismal interaction data. Jorrit H. Poelen, James D. Simons and Chris J. Mungall. (2014). Global Biotic Interactions: An open infrastructure to share and analyze species-interaction datasets. Ecological Informatics. https://doi.org/10.1016/j.ecoinf.2014.08.005. In addition, if you'd like to visually reference GloBI, please don't hesitate to use the GloBI logo collection created by Pepper Luboff. Muñoz, G., Kissling, W.D. & van Loon, E.E., 2019. Biodiversity Observations Miner: A web application to unlock primary biodiversity data from published literature. Biodiversity Data Journal. Available at: https://doi.org/10.3897/bdj.7.e28737. Muñoz, G., Trøjelsgaard, K. & Kissling, W.D., 2019. A synthesis of animal-mediated seed dispersal of palms reveals distinct biogeographical differences in species interactions. Journal of Biogeography. Available at: https://doi.org/10.1111/jbi.13493. Stucky, B. et al., 2019. Developing a vocabulary and ontology for modeling insect natural history data: example data, use cases, and competency questions. Biodiversity Data Journal, 7. Available at: https://doi.org/10.3897/bdj.7.e33303. Barbier, M. & Loreau, M., 2018. Pyramids and cascades: a synthesis of food chain functioning and stability D. H. Young, ed. Ecology Letters, 22(2), pp.405–419. Available at: https://doi.org/10.1111/ele.13196. Delmas, E. et al., 2018. Analysing ecological networks of species interactions. Biological Reviews. Available at: https://doi.org/10.1111/brv.12433. Bernasconi, R. et al., 2018. Global Networks of Symbiodinium-Bacteria Within the Coral Holobiont. Microbial Ecology. Available at: https://doi.org/10.1007/s00248-018-1255-4. Compson, Z.G. et al., 2018. Linking DNA Metabarcoding and Text Mining to Create Network-Based Biomonitoring Tools: A Case Study on Boreal Wetland Macroinvertebrate Communities. Next Generation Biomonitoring: Part 2, pp.33–74. Available at: https://doi.org/10.1016/bs.aecr.2018.09.001. Derocles, S.A.P. et al., 2018. Biomonitoring for the 21st Century: Integrating Next-Generation Sequencing Into Ecological Network Analysis. Advances in Ecological Research. Available at: https://doi.org/10.1016/bs.aecr.2017.12.001. Gotts, N.M. et al., 2018. Agent-based modelling of socio-ecological systems: Models, projects and ontologies. Ecological Complexity. Available at: https://doi.org/10.1016/j.ecocom.2018.07.007. Hutchinson, M.C. et al., 2018. Seeing the forest for the trees: putting multilayer networks to work for community ecology. Functional Ecology. Available at: https://doi.org/10.1111/1365-2435.13237. James, S.A. et al., 2018. Herbarium data: Global biodiversity and societal botanical needs for novel research. Applications in Plant Sciences, p.e01024. Available at: https://doi.org/10.1002/aps3.1024. Jiang, C. et al., 2018. Dynamic Human Environmental Exposome Revealed by Longitudinal Personal Monitoring. Cell, 175(1), pp.277–291.e31. Available at: https://doi.org/10.1016/j.cell.2018.08.060. Narango, D.L., Tallamy, D.W. & Marra, P.P., 2018. Nonnative plants reduce population growth of an insectivorous bird. Proceedings of the National Academy of Sciences, p.201809259. Available at: https://doi.org/10.1073/pnas.1809259115. Röttjers, L. & Faust, K., 2018. From hairballs to hypotheses – biological insights from microbial networks. FEMS Microbiology Reviews. Available at: https://doi.org/10.1093/femsre/fuy030. Stefani, S., Wright, M.T. and Baird, D.J., 2018. Zacchaeus G. Compson, Wendy A. Monk, Colin J. Curry, Dominique Gravel, Alex Bush, Christopher JO Bakerk, Mohammad Sadnan Al Manirk, Alexandre Riazanovk, Mehrdad Hajibabaei, Shadi Shokralla, Joel F. Gibson. Next Generation Biomonitoring, 59, p.33. Thessen, A.E. et al., 2018. 20 GB in 10 minutes: a case for linking major biodiversity databases using an open socio-technical infrastructure and a pragmatic, cross-institutional collaboration. PeerJ Computer Science, 4, p.e164. Available at: https://doi.org/10.7717/peerj-cs.164 . Beauchesne, D. et al., 2017. Thinking outside the box–predicting biotic interactions in data-poor environments. Vie et milieu- Life and Environment, 66(3-4), pp.333-342. Available at: http://wwwphp.obs-banyuls.fr/Viemilieu/index.php/volume-66-2016/66-issue-3-4/663-4-article-11.html. Coetzer, W., Moodley, D. & Gerber, A., 2017. A knowledge-based system for generating interaction networks from ecological data. Data & Knowledge Engineering. Available at: https://doi.org/10.1016/j.datak.2017.09.005. Desjardins-Proulx, P. et al., 2017. Ecological interactions and the Netflix problem. PeerJ, 5, p.e3644. Available at: https://doi.org/10.7717/peerj.3644. Heitlinger, E. et al., 2017. The Intestinal Eukaryotic and Bacterial Biome of Spotted Hyenas: The Impact of Social Status and Age on Diversity and Composition. Frontiers in Cellular and Infection Microbiology, 7. Available at: https://doi.org/10.3389/fcimb.2017.00262. McKinley, D.C. et al., 2017. Citizen science can improve conservation science, natural resource management, and environmental protection. Biological Conservation, 208, pp.15–28. Available at: https://doi.org/10.1016/j.biocon.2016.05.015. Nielsen, J.M. et al., 2017. Diet tracing in ecology: method comparison and selection. Methods in Ecology and Evolution. Available at: https://doi.org/10.1111/2041-210x.12869. Pauli, J.N. et al., 2017. Opinion: Why we need a centralized repository for isotopic data. Proceedings of the National Academy of Sciences, 114(12), pp.2997–3001. Available at: https://doi.org/10.1073/pnas.1701742114. Parr, C.S. & Thessen, A.E., 2017. Biodiversity Informatics. Ecological Informatics, pp.375–399. Available at: https://doi.org/10.1007/978-3-319-59928-1_17. Peterson, A.T. & Soberón, J., 2017. Essential biodiversity variables are not global. Biodiversity and Conservation. Available at: https://doi.org/10.1007/s10531-017-1479-5. Stec, K.F. et al., 2017. Modelling plankton ecosystems in the meta-omics era. Are we ready? Marine Genomics. Available at: https://doi.org/10.1016/j.margen.2017.02.006. Adams, J. et al., 2016. A century of Chinook salmon consumption by marine mammal predators in the Northeast Pacific Ocean. Ecological Informatics, 34, pp.44–51. Available at: https://doi.org/10.1016/j.ecoinf.2016.04.010. Amano, T., Lamming, J.D.L. & Sutherland, W.J., 2016. Spatial Gaps in Global Biodiversity Information and the Role of Citizen Science. BioScience, p.biw022. Available at: https://doi.org/10.1093/biosci/biw022. Basset, A., 2016. e-Science perspectives for the conservation of transitional and coastal wetlands. Aquatic Conservation: Marine and Freshwater Ecosystems, 26(3), pp.411–415. Available at: https://doi.org/10.1002/aqc.2683. Buttigieg, P.L. et al., 2016. The environment ontology in 2016: bridging domains with increased scope, semantic density, and interoperation. Journal of Biomedical Semantics, 7(1). Available at: https://doi.org/10.1186/s13326-016-0097-6. Chandler, M. et al., 2016. Contribution of citizen science towards international biodiversity monitoring. Biological Conservation. Available at: https://doi.org/10.1016/j.biocon.2016.09.004. Khabibullin, V.F., 2016. Location and foraging as basis for classification of biotic interactions. Theory in Biosciences. Available at: https://doi.org/10.1007/s12064-016-0228-8. La Salle, J., Williams, K.J. & Moritz, C., 2016. Biodiversity analysis in the digital era. Philosophical Transactions of the Royal Society B: Biological Sciences, 371(1702), p.20150337. Available at: https://doi.org/10.1098/rstb.2015.0337. Parr, C.S. et al., 2016. TraitBank: Practical semantics for organism attribute data. Semantic Web, 7(6), pp.577–588. Available at: https://doi.org/10.3233/sw-150190. Proença, V. et al., 2016. Global biodiversity monitoring: From data sources to Essential Biodiversity Variables. Biological Conservation. Available at: https://doi.org/10.1016/j.biocon.2016.07.014 (Please note that GloBI was mentioned in the text, but a citation was omitted. Corresponding author has been contacted). Schigel, D., 2016. Beetles versus Fungi: Trophic Interactions in Boreal Forests. Environmental and Microbial Relationships. In: The Mycota, Volume IV, pp.269–278. Available at: https://doi.org/10.1007/978-3-319-29532-9_14. Costello, M.J. et al., 2015. Biological and ecological traits of marine species. PeerJ, 3, p.e1201. Available at: https://doi.org/10.7717/peerj.1201. Foulger, R.E. et al., 2015. Representing virus-host interactions and other multi-organism processes in the Gene Ontology. BMC Microbiology, 15(1). Available at: https://doi.org/10.1186/s12866-015-0481-x. Gray, C. et al., 2015. Joining the dots: An automated method for constructing food webs from compendia of published interactions. Food Webs, 5, pp.11–20. Available at: https://doi.org/10.1016/j.fooweb.2015.09.001. Hortal, J. et al., 2015. Seven Shortfalls that Beset Large-Scale Knowledge of Biodiversity. Annual Review of Ecology, Evolution, and Systematics, 46(1). Available at: https://doi.org/10.1146/annurev-ecolsys-112414-054400. Kissling, W.D. et al., 2015. Towards global interoperability for supporting biodiversity research on essential biodiversity variables (EBVs). Biodiversity, pp.1–9. Available at: https://doi.org/10.1080/14888386.2015.1068709. Poisot, T. et al., 2015. mangal - making ecological network analysis simple. Ecography. Available at: https://doi.org/10.1111/ecog.00976. Poisot, T. et al., 2015. Synthetic datasets and community tools for the rapid testing of ecological hypotheses. Ecography. Available at: https://doi.org/10.1111/ecog.01941. Soranno, P.A. et al., 2015. Building a multi-scaled geospatial temporal ecology database from disparate data sources: fostering open science and data reuse. GigaSci, 4(1). Available at: https://doi.org/10.1186/s13742-015-0067-4. Szoboszlai, A.I. et al., 2015. Forage species in predator diets: Synthesis of data from the California Current. Ecological Informatics. Available at: https://doi.org/10.1016/j.ecoinf.2015.07.003. Thessen, A.E. et al., 2015. Data Infrastructures for Estuarine and Coastal Ecological Syntheses. Estuaries and Coasts. Available at: https://doi.org/10.1007/s12237-015-0045-1. Thessen, A.E. et al., 2015. Emerging semantics to link phenotype and environment. PeerJ, 3, p.e1470. Available at: https://doi.org/10.7717/peerj.1470. Vanden Berghe, E. et al., 2015. Retrieving taxa names from large biodiversity data collections using a flexible matching workflow. Ecological Informatics, 28, pp.29–41. Available at: https://doi.org/10.1016/j.ecoinf.2015.05.004.